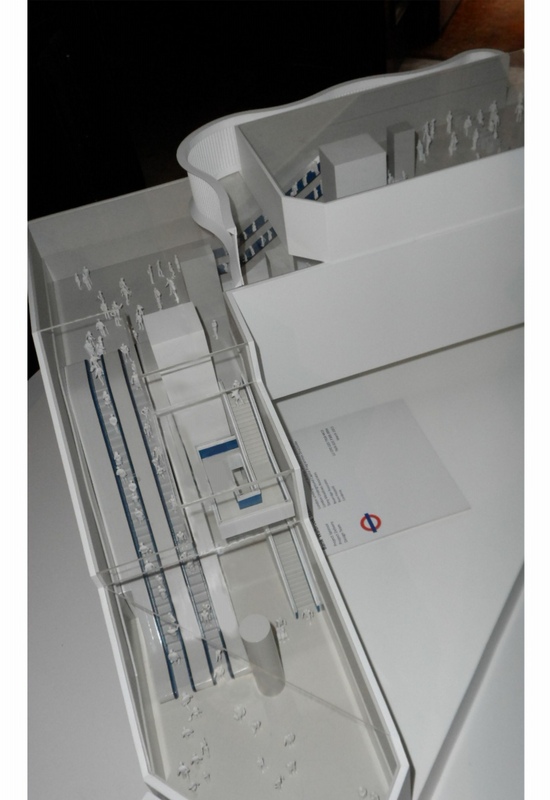 Recently there was an exhibition about the updated proposals to greatly enhance Bank station capacity, a scheme that should be completed in 2021 if all goes according to plan. As a result of those proposals, although it may seem rather perverse, we should take a look at the details of the new Walbrook entrance to Bank station – something which is in the process of being constructed now. The shell of the station entrance and the bare passageways are due for handover from the developer to TfL in the summer of 2014 and the fully-fitted out entrance is due to open by December 2015. Those of you who cannot wait for our detailed report on the main proposals for Bank station are referred to IanVisits’ report of the exhibition and Walthamstow Writer’s excellent pair of annotated photos here and here. We will use part of the latter one of these to assist with this article. We have covered the Walbrook entrance before as part of part 1 on the Bank Upgrade over a year ago. Details were sketchy then and the Bank Capacity Upgrade project team seemed to regard the Walbrook entrance as a separate project which was nothing to do with them. Consequently, at that exhibition, they were unable to provide us any more details than the few that were already in the public domain. This time around though it was very different and the new entrance is shown both on the plans released as part of the consultation and also on the main 3D model. In addition they also had an excellent separate model of the Walbrook entrance at the latest exhibition, albeit located away from the other exhibits where it was easy to miss. The Walbrook entrance to Bank station will be a new entrance constructed as part of an office development, with TfL only paying for the fitting out of a concrete box that is being constructed by the developer. As reported before, it is going to be very close to Cannon Street station and is primarily intended as a dedicated entrance to the Waterloo & City (W&C) Line. 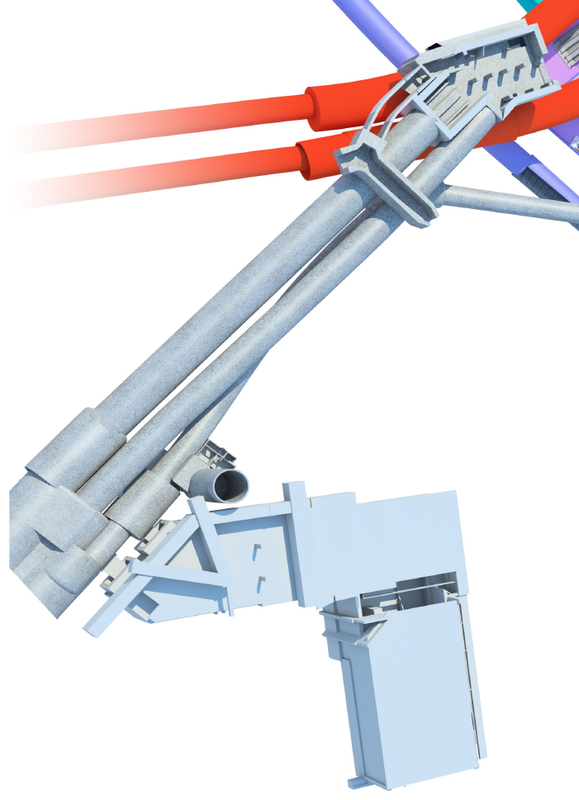 This 3D picture is part of this PDF consultation document and is looking downwards. It shows the Walbrook entrance to Bank (W&C) platforms. 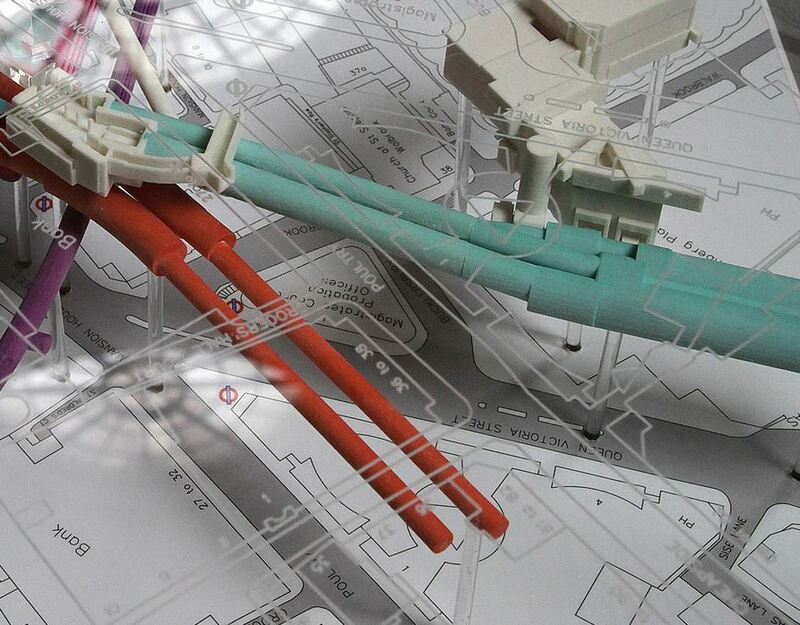 The existing W&C tunnels are shown in mottled light grey and the new Walbrook entrance currently being built is shown in plain light turquioise. The above detail is an extract taken from one of the information sheets made available as part of the latest consultation on Bank station. It has then been re-orientated so that north is at the top. The two Waterloo & City platforms are on the extreme left, each with their own station tunnel. The location of the buffer stops would only just be inside this 3D representation. Most of the platform would be excluded from this diagram. Beyond the platforms going in a north-easterly direction are three tunnels. The south-easternmost one on the right is the smallest (least diameter) of the three and is not as obvious as the other two on the model or 3D diagram, for both this reason and also because it eventually goes underneath the middle tunnel. 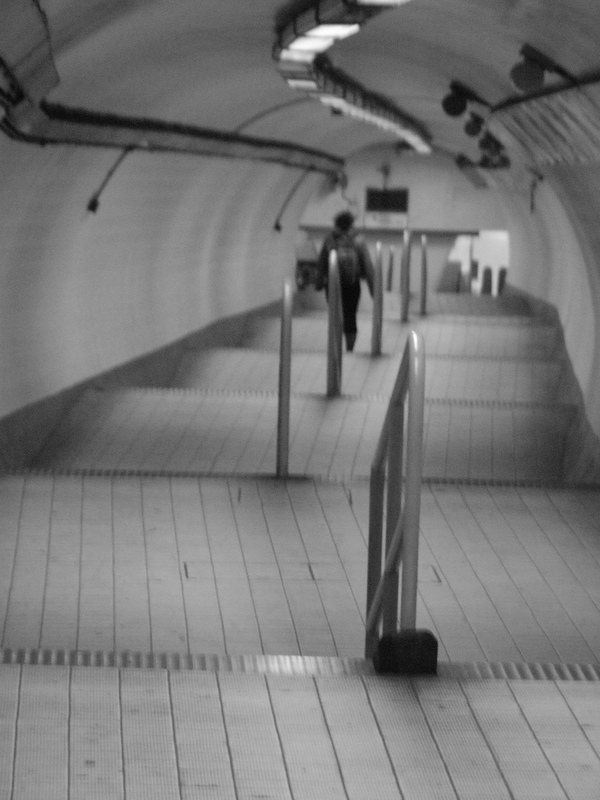 The Drain – now little used since the availability of the travelator. Thanks to failing angel for making this available on flickr under a creative commons licence. We will start with the middle tunnel. This passageway uses the original route to the W&C platforms from the surface and originally consisted of a unpleasantly steep slope. It is generally believed that the nickname for the W&C, the Drain, originally referred to just this tunnel. It was built as a cheaper alternative to putting in lifts and as a consequence the platforms were moved back south-westwards from their originally planned location and the originally intended platform location was used for sidings. The sloped walkway as originally built was very unpopular and was soon regraded to have a step placed every few yards to reduce the slope. This might have improved the situation slightly but it does appear that for over sixty years this unpleasant passage was a continual source of complaint. For the purposes of this article we will refer to this tunnel as “the Drain”. In the early 1960s a replacement was finally provided for the Drain. Or to be more accurate, a more satisfactory alternative was provided. This was, at the time, something very novel called a Trav-O-lator – in effect a moving walkway – but at this location it was installed on an incline. Two were installed. You can read all about them in IanVisits’ excellent article on them. In order to install the travolator or travelators (as they were later generally spelt) the north-westernmost siding tunnel had to be abandoned and tunnelled through. The travelators almost made the Drain redundant, but not quite. In the morning peak period it was necessary to use both of them in the up direction to enable the arriving passengers to leave the station before the next train arrived. The few passengers who travelled against the main flow had to use the Drain. Construction of the tunnel to house the travelators was a major civil engineering undertaking in its own right. There is an excellent model at Acton museum of the construction. Recently the travelators were replaced by ones built by a different company. The original Trav-O-lator was a trademarked name associated with a specific company. Because currently quite a few companies offer similar products, it is nowadays considered more correct just to refer to them by the generic term of “moving walkways”. On the right hand side there is still the original tunnel that for many years housed a siding. When the DLR Bank extension was built this tunnel was extended and joined to the rest of the labyrinth that is Bank station in order to provide passenger access from the W&C to the DLR. At the same time it also improved interchange with the W&C and both the Central and the Northern Line platforms. By providing this direct connection it was no longer necessary for passengers to go up to ticket hall level and go back down again. When walking along this tunnel one can deduce exactly how far it originally extended as the original builders buried the tunnelling shield used to construct it at the end. This shield was rediscovered during the DLR works and is now painted in bright red whilst a small plaque nearby explains its significance. This extract from one of Walthamstow Writer’s photos shows the tunnels that have been discussed from a different perspective. The camera is pointing towards what is south-east on the model. As can be clearly seen from the plan, and even more clearly from an extract of Walthamstow Writer’s second photo (above), the Walbrook entrance will connect to the W&C platforms just beyond the buffer stops of the south-eastern platform. This will therefore provide an alternative for W&C passengers to enable them to exit the station without having to intermingle with other passengers. It should also help reduce any congestion that there may be at the foot of the moving walkways. Whilst it would make no difference to interchanging passengers, those passengers who are exiting to the street will have a greater choice. The can either continue to use the moving walkways (or much less likely head for the DLR tunnel) or use the new Walbrook entrance. An overview of the new entrance. Its spaciousness suggests it is believed it will be well used. The model exhibited at the recent exhibition indicates that this entrance is not going to be some cramped alternative shoehorned into a new development. It looks pleasantly spacious and will provide escalators, lifts and a separate staircase to the platforms. This seems to be in contrast to the relatively small new Bank entrance on the north side of Cannon Street which is proposed as part of the Bank Station Capacity Upgrade. 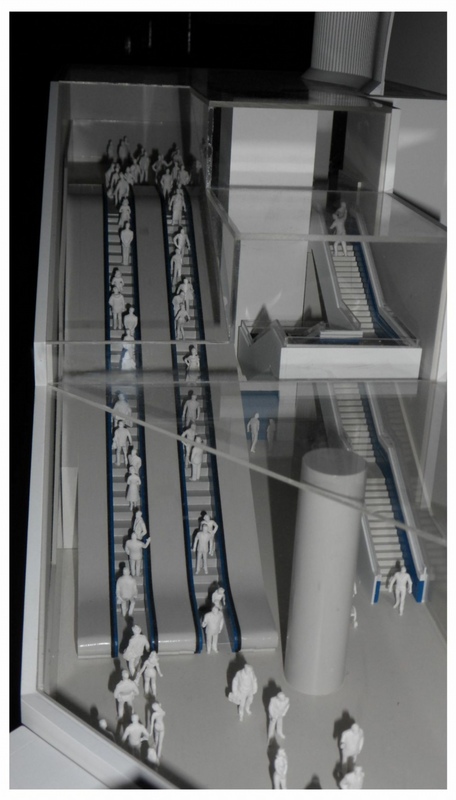 The model in more detail showing escalators, stairs and a lift co-existing. It is not known if anywhere else on London Underground provides all of lifts, escalators and a fixed staircase (other than within the escalator shaft or as an old spiral emergency staircase). It is probably the first time a tube station entrance has been built with both escalators and separate publicly-accessible stairs (not in the escalator shaft). One possible reason for the fixed stairs is that, as with the moving walkways, the intention is to run both escalators upwards in the morning peak and the stairs are needed in case there are passengers wishing to travel in the reverse direction. The ticket hall seems surprisingly large. Less surprising is the apparent absence of a ticket office. With London Underground anxious to phase out ticket offices (in their traditional form) where possible, it made sense not to build it in the first place. The entrance in Walbrook currently being built. The ticket hall is large and spacious although one wonders if “ticket hall” is quite appropriate for an entrance with no ticket office and most passengers using Oystercards. The entrance and exit onto the now-pedestrianised street has clearly been located as far south as possible. This would seem logical in order not to effectively duplicate existing entrances. One consequence of this, as pointed out in an earlier article, is that it is surprisingly close to Cannon Street station. Interchange between Cannon Street (LU) and Bank is not currently recognised as an Out of Station Interconnection (OSI) for ticketing and Oyster purposes but it would seem that logically it should be once the Walbrook entrance is opened. The Walbrook entrance will be part of Bank station and most readers know that, internally in London Underground, Bank and Monument are treated as a single station. This is partly down to fire regulations which require the interconnected passages to be under unified control. The control room for Bank/Monument is actually located at Monument station and in the event of an incident at the Walbrook entrance or even on the W&C platforms, the quickest way for the station supervisor to get from the control room to the incident will be at street level and in doing so he will practically pass Cannon Street Underground Station entrance. What is not known publicly is the opening hours of this future entrance. There would appear to be very little point in it being open when the W&C is closed. The train service on the W&C starts slightly later than other tube lines Monday to Saturday but closes at roughly the same times as other lines. It remains closed on Sunday unless engineering works cause the Northern Line to be suspended in the central area in which case it is opened to reduce the inconvenience to passengers. Expect the W&C to run on Sundays on a regular basis for a few months in 2020 if the main proposals for the Bank Capacity Upgrade are approved. The opening of the Walbrook entrance will certainly be a minor event compared to the completion of the main passenger upgrade despite being fairly substantial in its own right – one new entrance, four new escalators and two new lifts. It will also probably do little to relieve the rest of Bank station. It should, however, provide some relief to the passageways under the Bank junction itself and also be a welcome foretaste of what we hope is to come. TfL have announced that the site at Walbrook has been handed over to them by the developers of the Bloomberg building. This means TfL’s contractor can commence the tunnelling works to link into Bank station and also fit out the new station. One immediate consequence will be the closure of the W&C line connecting tunnel, to the DLR and other lines, from this weekend for 10 months. 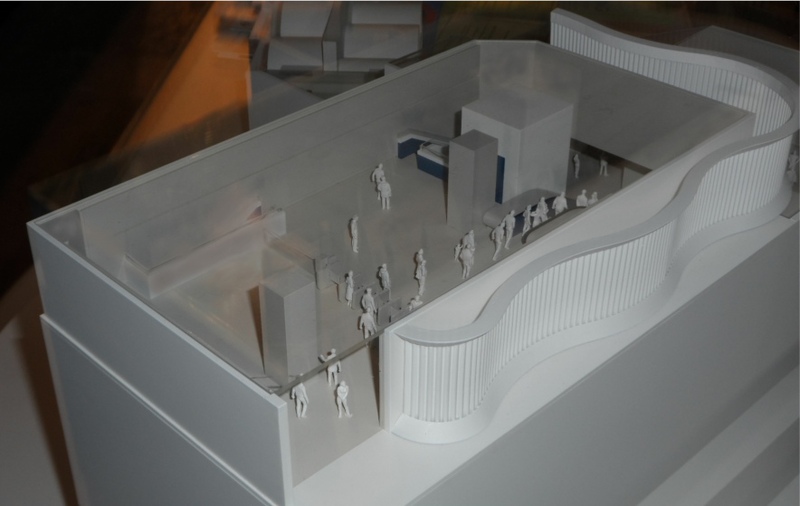 There is link from the press release to some press office images of the new ticket hall and escalators. Discussion of the plans for the other “Bank job” made me look this up. The original article suggested it should have been finished by now, but the Bloomberg developers only handed the site over last month, instead of “summer 2014” – never trust a deadline defined by the seasons – and the connection to the Northern Line is expected to be closed for ten months, so presumably we are looking at September at the earliest. The link in WW’s post above says “late 2017” for the opening , so not only is the handover fifteen months late but the construction period is now two years instead of 15 months, and the total delay is two years. I thought it was only Network Rail that could over-run programmes – or have I been reading too many newspapers and listening to too many politicians? No recent progress reports on here, but from what can be seen at surface level behind the Bloomberg Place hoardings along Walbrook, this is starting to look well advanced. What is the scheduled opening date ? This appears to be the latest info, but ther are contact details provided there. That link is to the big project on the Northern Line platforms. This is the (completely separate) Walbrook project at Bank, giving direct access to the line-that-must-not-be-named. @ John UK – the most recent official comment on the Walbrook scheme I can find is in the Q4 TfL operations and invesmtent report. That shows only a couple of milestones with bringing into service scheduled for Dec 2017 so quite a long way to go. 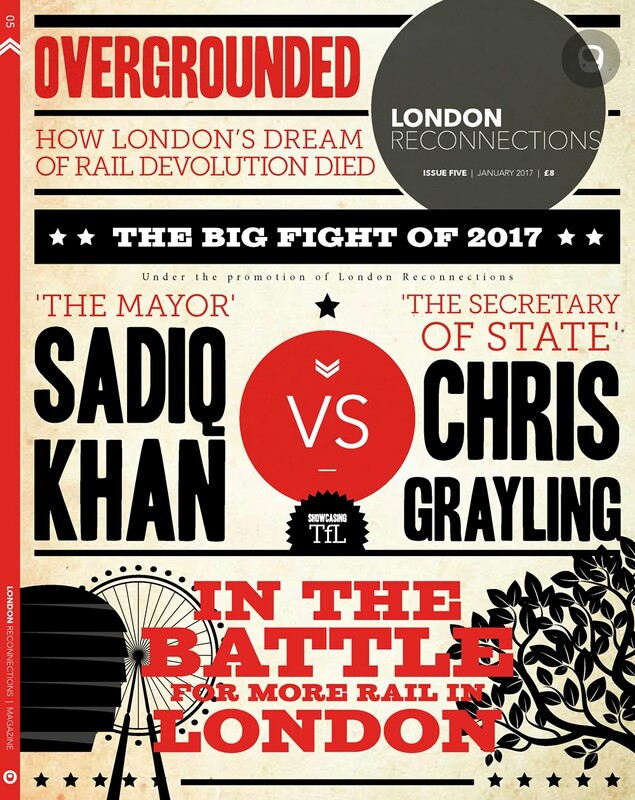 Unfortunately the change in Mayoral regime and decisions to rejig TfL’s governance and meetings has caused a gap in reporting. I have yet to say any document giving a project update to the Board or a sub committee and we are almost at the point where a Q2 report is due but we haven’t seen a Q1 one yet. I’m not sure how well that stacks up alongside promises of better transparency given we have seen information on revenues, costs, headcount and a few other metrics. A general point which comes out of this thread is the fact that many commuters would benefit greatly in having entrances/exits at both ends of the platform at some well separated stations. Depending in part on the depth of the line this often yields entrances a considerable distance apart on the surface. The argument about Mansion House (yes, needing a name change) is well made – it could better serve St Pauls, One New Change and the Millenium Bridge, prominent tourist destinations, with a new western entrance. Aldgate East is a good example of two ended access particularly when also made possible from different sides of a busy road. Two entrances also help with distributing passengers along the platform – but not at Bank W&C where both entrances are at the same end. Access from the ticket hall of Mansion House (station – not the actual residence!) would have been much more useful than the Walbrook entrance we have actually got. Do I recall correctly that the City Corporation safeguarded a site for a station under Cannon Street somewhere, with a view to its use by their much desired western extension of the DLR, not to terminate at Bank, but to proceed westwards towards Fleet Street and the Strand. I seem to recall a hand-out leaflet produced by them, what happened to all that? Being used for the new Northern Line bank ticket hall and entrance with demolition of the buildings on site nearly down to ground level. PS It was originally for the Fleet line as Stuart has pointed out. @Stambourne. That was associated with eastwards extension of the then Fleet ( now Jubilee) Line which was planned to be extended eastwards from Charing Cross beneath Strand, Fleet Street to Fenchurch Street Station and docklands but was replaced by present route via Waterloo. I suppose these works may still lay under Cannon Street unused …. Way back in October 2013 the subject of Cannon Street only having lift access to westbound platform with suggestion that another station in this area might coverthe eastbound trains. Well we now have Tower Hill Station accessible in both directions but in order to switch directions users have to exit one part Tower Hill Station and re-enter the other and no weather proof cover has been provided! When the new accessible entrance to Bank Waterloo and City Line opens will the exit at Waterloo end be adequate to qualify as being step free ? The Fleet Line Stage II Cannon Street works are described in the first part of the Fleet/Jubilee series. Cannon Street Fleet Line station was to be double-ended, lying between the mainline railway station* and Monument**, providing an interchange to the Northern line via Bank station at the latter. *The western at 80 Cannon Street is effectively where the M&S food store now is at the station entrance. in the act of having its hoarding painted TfL blue. The Fleet Line, as I understand it, was to have run underneath the District Line, which in turn runs under Cannon Street (the thoroughfare, from which the main line station takes its name). Allowing for the slope of escalators, it is about a train length from the the main line station which takes its name from the thoroughfare, and as is now being demonstrated, ideally placed for a tie in under the ground to the Bank/Monument complex. Having entrances on both sides of the road under which the line runs seems to be not only possible but desirable – not to mention commonplace – you need look no further than Monument for an example. The District and Circle run under Queen Victoria Street cutting the corner with Cannon Street with Mansion House station then along Cannon Street and then Eastcheap. The Fleet line would have been underneath along Cannon Street and Eastcheap before heading further north at the start of Great Tower Street to Fenchurch Street Station instead. The DLR used the Fleet alignment under Eastcheap. It is also worth remembering that Station naming and illustration convention in the Bank-Monument complex has changed over the years. The eastern end of the Fleet line station would have been well linked to the western end of the District and Circle platforms and the southern end of the Northern platforms with both lifts ans escalators possible. Canada Water has lifts, escalators and steps. Still not open last time I looked. “Late 2017” looking a little optimistic now – only four working days left. @ Timbeau – I quote below the most recent commentary from the TfL Investment Programme report. We continue final fit-out works in the non public areas of the station and these are scheduled to complete in December. Following issues obtaining fire doors with the correct certification, the entrance is now planned to open in February 2018, which is reflected in the amber 2017/18 budget milestone RAG status. We are reviewing the schedule, however, to identify if this can be brought forward. We also seem to have some issues with lifts at Victoria where there are contractor delays that may mean the station is not fully step free when the new south ticket hall opens. That is supposed to be imminent but I haven’t been to Victoria for a fair while so don’t know how things are going in the south ticket hall. According to page 79 of the latest Investment Programme Report the forecast date for completion is 10-May-18. Note this is just the date when the works are complete so it still needs signing off so maybe mid-May. Various reasons given over the years (out of TfL’s control and the responsibility of the developer) but issues with the fire doors (within TfL’s control) is the latest one. FYI, that link appears to be broken. Was there on Tuesday to see if it had been opened. Thanks POP now I know its May b4 they open Walbrook’s new entrance. @Stuart: Not in the case of Bank/Monument, given the complexity of the station and the fact that there is another construction project going on a block or two down the road! Yes. This has nothing to do with the project a short distance down the road. I suspect it is partly down to this contractor not really having the experience to fit out a station shell though this is just a guess. But I can’t think of the last time that such a situation occurred (a similar contract). It is normally a really big contractor who digs the hole as well who gets involved. John Bull told me once that sometime London Underground have to explain to contractors just how hard it is to fit out or re-fit a station to the required standards. New entrants tend to totally underestimate the complexity of fitting out a working station and are not used to things like the level of paperwork required to get the thing signed off. Yes, Stuart, to some extent true. But it all has to link into the existing station without making anything non-operational. So something that might seem simple such as adding a few fire alarm points ends up being quite major as you have to prove to a rigorous standard that the entire fire alarm system is still functional for the whole station. Another typical failure is to not appreciate how cables must not be exposed when possible for either aesthetic or other reasons. So a firm might think a cable run is really easy and not realise the actual complexity of what they have to do just to get a loudspeaker cable in place. Or the fact that a loudspeaker cable may be considered safety-critical and needs to be able to withstand a fire for a certain amount of time as well as being inaccessible to the general public. @PoP: Your comment above about fire alarms is exactly why I expected that to have an influence on the amount of effort required. Surely works over the other side are also connected to the overall station systems, or haven’t they gotten that far yet? Nowhere near. Still at the hole digging and tunnelling phase. Before the Xmas break or before 31/12/2018? Worth making a trip to the bookies for it? Spotted today – two workmen putting up a white-on-blue “BANK STATION” sign above the entrance. (I took a photo – I’d upload it if I knew how). The Stirling Prize presumably does not give points for on-time completion. Walked down Walbrook this morning and they have taken all the covers off all the signs (and seemed to be clearing clutter from the top floor into a van). Maybe it will actually open in December. I went past there too today. Apart from the reveal of the signage, little has changed – still quite a lot of clutter behind the gates to clear away. It looks like it could be cleared over a weekend, but in truth it has looked like that for about six months. At the other end of the line, the signage has also been revealed on the York Road (Shell Centre) entrance to Waterloo Tube. Upstairs, I really can’t see platforms 21 and 22 being ready by the end of the year as promised. I saw a sign at Waterloo Underground this morning saying the Walbrook entrance was open. @SH(LR) So have I (and indeed platform 20 still sees regular use), but after their temporary use during the great shutdown of platforms 1-8 in mid-2017, platforms 21-24 have been closed again to rebuild them (again) for a more permanent integration into the main station. Escalators were installed (by which I mean, an additional structure was built and the escalators were installed) at Limehouse DLR (south side). The escalators are in situ – have been for about six months – but nothing has been done to commission them, and the work site looks abandoned – a bit of a mess frankly. I’ve tried to get an update from DLR on Twitter but they’re just ignoring the question. “Soft” opening 10 am today, I’m told. @Timbeau for which? Walbrook, Waterloo or Limehouse? @ Timbeau – correct. The Bloomberg entrance has opened this morning. Ianvisits has been along for a look. The one this article was about – Walbrook. The gateline staff at Bank told me at about 0930 this morning (when I mentioned the premature noticeboard at Waterloo), and there was a lot of activity at street level when I went past. I went back just now to have a proper look: compared with the old entrance it’s enormous – and given that they often have to limit access to the that, I wonder whether the line will be able to cope with the higher passenger footfall now possible. The staff on the gateline told me the delay in opening had been because of the discovery of the Mithraeum, but that happened in 1954 – it was always part of the plan for the Bloomberg building that the Mithraeum would be re-located there, on its original site. There were additional archaeological ‘discoveries’ under excavation not bothered with in the 1950s when preserved timbers were ‘disposed’. Also sections of the original fragile foundations were discovered and preserved in situ requiring the relocation to be moved slightly. I was very impressed with the whole presentation and recommend spending a spare couple of hours. Note much of the original finds are at the Museum of London. IanVisits attributes the delay to fire door problems and contractors. It is a relief that the polished steep ramp from the ticket hall can be avoided. I’ve slipped down there just with blakeys, no wonder the ladies remove their stilletos. DLR twitter team have (belatedly) answered my query. New escalators at Limehouse DLR station to come into service on Monday 17 December. Definitely quicker than the alternatives (walking from the main Central Line exit or going via Monument), and more pleasant. That would be so much more useful if you’d mentioned which signs to follow to reach that exit. From the Northern line, follow the signs to the W&C. When you’re almost there you’ll see a way out on your left which is signed “Walbrook”. I remember watching that video now!